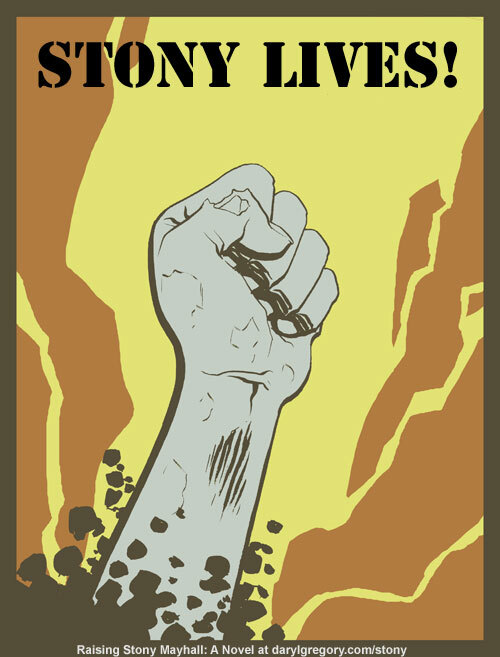 A reader of Stony wrote me and said that I ought to make “Stony Lives!” posters. So, courtesy of the amazing Scott Godlewski (the main artist behind the first comic I worked on, Dracula: The Company of Monsters), here’s a recruitment poster for The Living Dead Army. Del Rey did a lovely thing at Comic Con: they did a massive giveaway of my first novel, Pandemonium, and I sat and signed them for an hour and a half, all as a way of fooling people into buying copies of Raising Stony Mayhall. This scheme kind of worked. Mysterious Galaxy bookstore, which had a booth next door, sold out all their copies, including the copies that Del Rey gave them. Thanks to everyone who came by. Hope you dig it. …in the terms of literary scholars, Daryl Gregory has ‘‘deconstructed’’ the familiar zombie story, providing a self-reflective ‘‘meta’’ take on it. Fortunately for the rest of us, Raising Stony Mayhall is also a fast-paced, exciting narrative laced with both humor and moments of pathos. I like reviews that end in commands. Of course you should make t-shirts! I may or may not be using that poster as my new avatar as we speak. I finished ‘Stony’ last night and am now left staring at the pile of books I was going to read next as if they are bits of gristle left behind on someone’s plate. What can I read now that will compare? I suppose it’s back to the book store for me to find more of your work. I also wanted to say that I would never have found your book if it wasn’t for Goodreads. A friend won an advanced copy, loved it and reviewed it. As my favorite book so far this year I’ll be spreading the word…..STONY LIVES! I would just like to tell you that Pandemonium was the best book I read last year, and having just finished reading Raising Stony Mayhall, I can now say it’s the best book I’ve read this year. I also really enjoyed The Devil’s Alphabet, but I read it the same year as Pandemonium, so it just missed being a best of the year. I tend to like my fantasy books fairly real-world based, and yours perfectly blend our recognizable world with some pretty crazy happenings. I’m generally not a fan of zombie books/movies, so I admit I was prepared to be disappointed this time, but your total reversal of the classic zombie tale and your completely lovable characters won me over. I’m a librarian, and I can assure you I’ll be pushing your books on most anyone looking for a great read — except maybe the ones who are looking for something like Debbie Macomber. Thanks for the wonderful books! You’re welcome, Susan! Any librarian is a friend of mine. I think my basic marketing problem is that it’s a zombie book for people who don’t like zombie books, so thanks for taking a chance — and thanks as well for all the kind words. Of course, I’m also hoping that people who _do_ like zombie books are willing to see a different take on the genre. That’s called having your brains and eating them too.